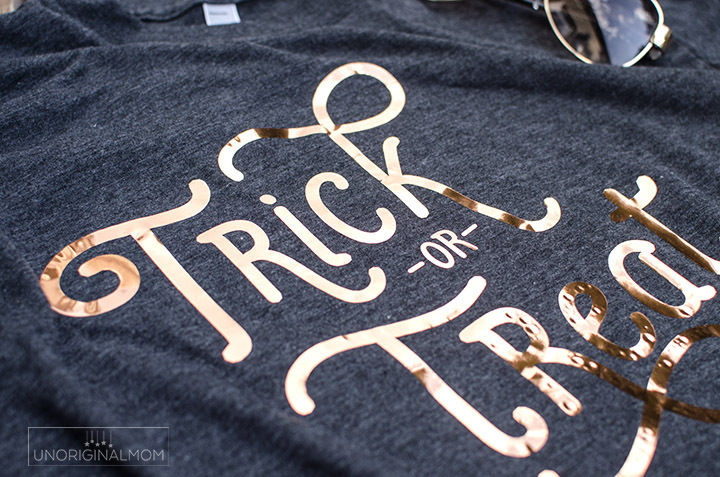 I tried out Silhouette America’s new Copper Heat Transfer Vinyl the other day, and WOWEE is it pretty!! 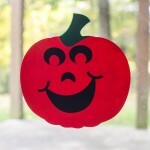 I created a fun “Trick or Treat” women’s Halloween shirt out of it. 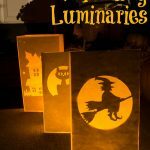 Read on to hear more about copper heat transfer vinyl and get the free Silhouette cut file to make your own! Over the summer, Silhouette sent me a box of samples of all their new products (it was like Christmas morning!) 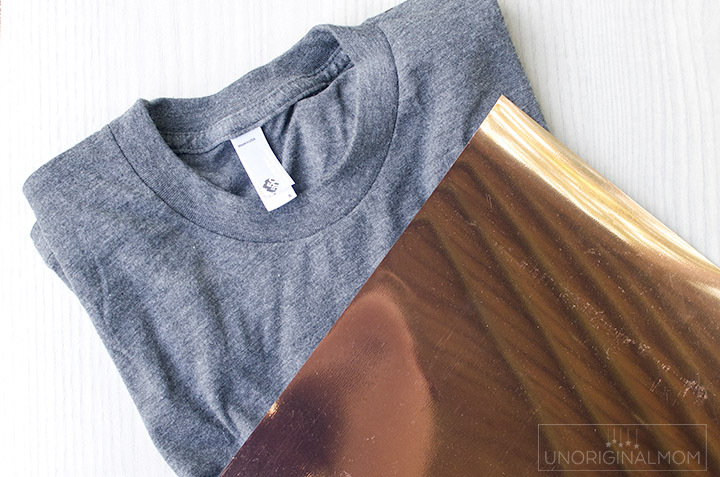 and the one that I think I was *most* excited about was this copper heat transfer vinyl. Guys, photos just don’t do it justice. It is SO pretty! I got a single sheet of it as a sample, but it comes in 12″ x 36″ rolls. I had trouble deciding what kind of project to use it on, but eventually decided it was just perfect for a Halloween t-shirt. 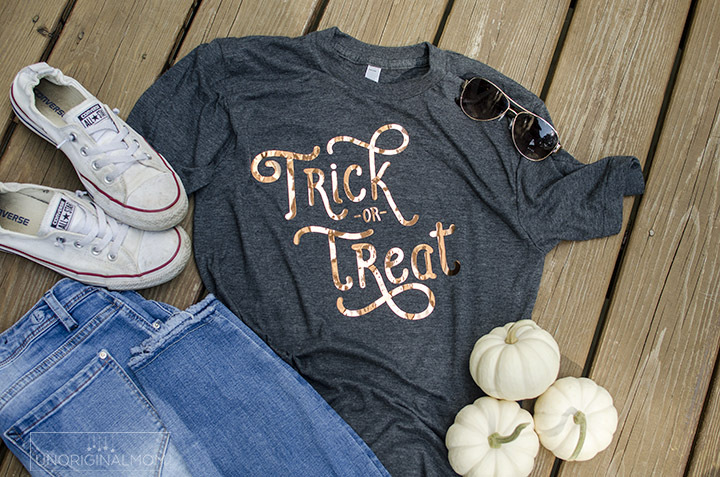 I’m not a big costume person, so I don’t dress up to hand out candy or go trick-or-treating with my kids…but a Halloween t-shirt? That I can do. Most of the ones you find in stores are pretty loud and colorful, neither of which are really my style, so I crafted up a simple graphic tee. My absolutely favorite t-shirts to craft with are these American Apparel 50/50 blend crewneck t-shirts. They have that soft vintage-tee feel to them, and the unisex fit is really flattering and comfortable. I find them to be pretty true to size – I’m 5’8″ and pretty average build and I wear a small for a snug fit, a medium for a more loose and baggy fit. 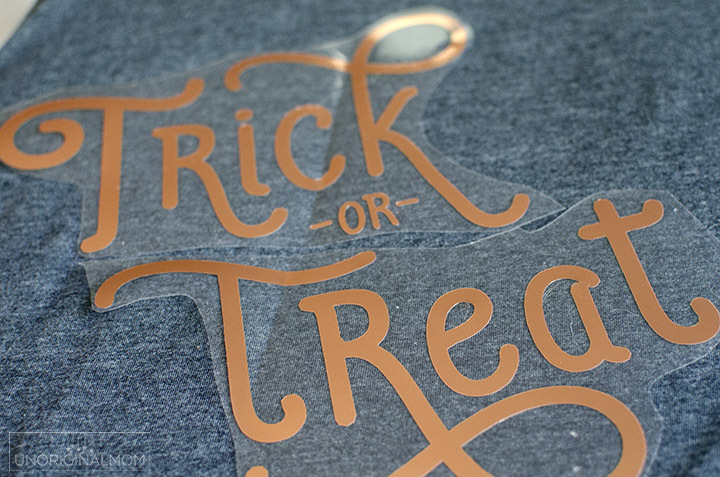 I whipped up the “Trick or Treat” design myself in Silhouette Studio, mirrored the design, then cut the copper heat transfer vinyl with my Silhouette. I found that it was thicker than normal HTV and needed a blade of 3 and a thickness of 8 to cut on my machine. (Always do a test cut first!) If you’re new to crafting with HTV, I have a detailed tutorial on how to use HTV here. Then I ironed it onto my t-shirt, and voila! 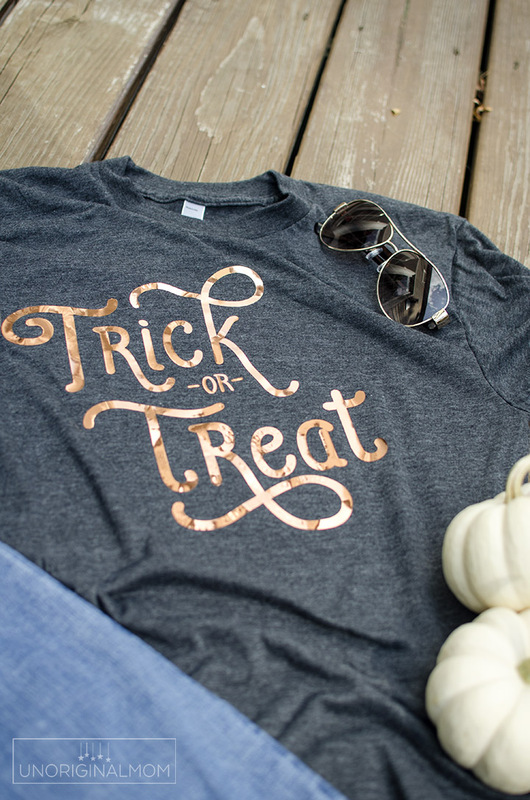 A unique and gorgeous shiny Halloween t-shirt! It looks SO neat in person. Now, don’t expect flawless results like you would with regular HTV. I think because it’s thicker, shiny, and doesn’t have any give to it, it doesn’t adhere completely smoothly. You can see that there are some small round dimples and pulls on the edges if you look really closely. 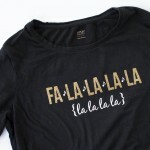 I was kind of bummed at first, thinking I screwed it up…but really, once you’re wearing it all you see is the shine! It’s not noticeable at all, I promise. 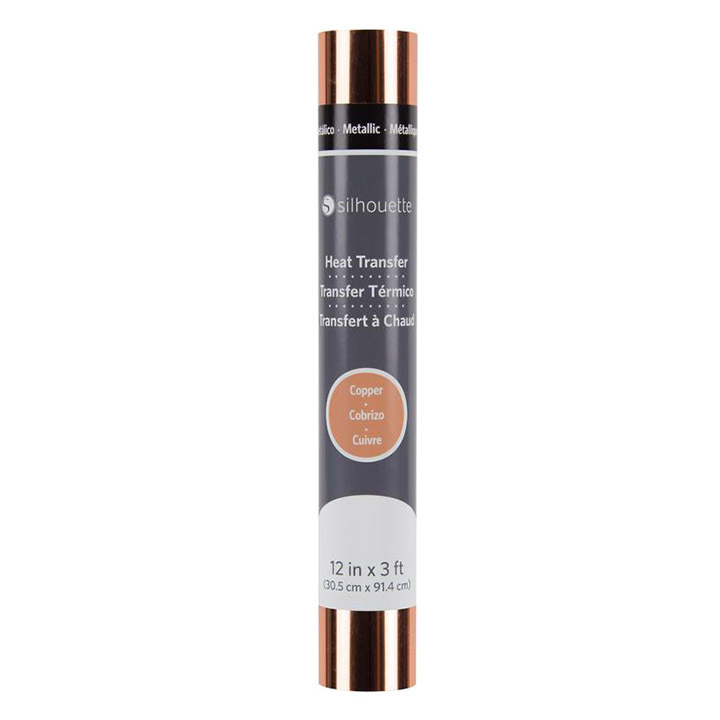 It also adheres really quickly so you don’t have to give it as much heat or pressure with your iron as you would for regular HTV. Speaking of this cut file, I’ve added it to my Silhouette library, so you can snag for FREE it via the form below! 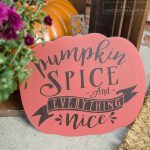 Pumpkin Spice Sign with Wood Vinyl – Free Cut File! What font did you use?? I love it! Hi Jenna, the font is Auther Typeface but I made a fair amount of modifications to the text for the design.